[CINCINNATI] ‒ On Wednesday evening, a large group of union members, leaders and activists held a rally at the Laborers Local 265 in Cincinnati to kick-off the Labor 2018 election effort to elect worker-friendly candidates in the 2018 elections. “All of these labor-endorsed candidates are standing up against powerful out-of-state interests that seek to take away our rights, whether it be our right to vote, or our freedom to join in unions,” said Ohio Association of Public School Employees Executive Director Joe Rugola. 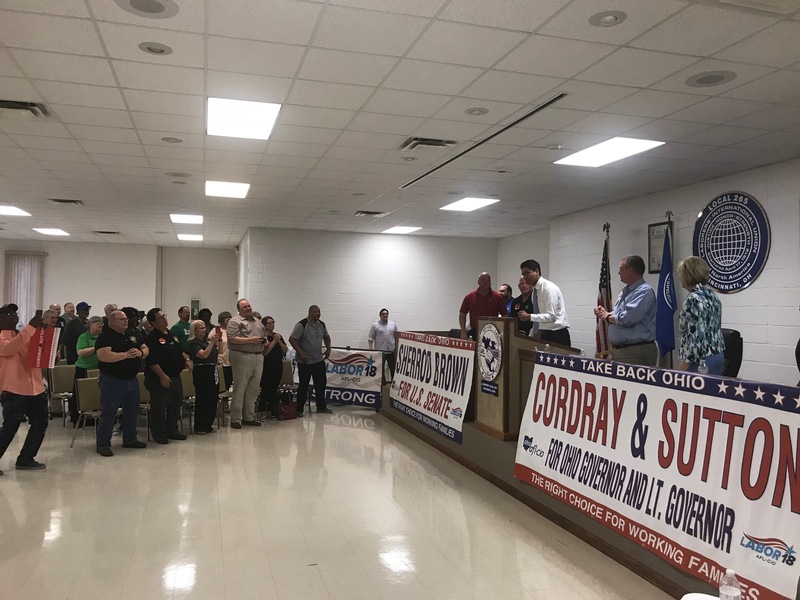 “Sherrod Brown, Richard Cordray and the entire statewide ticket are going to have our full support in these elections because they stand with working people and will have our back in these fights,” Rugola said. “Southwest Ohio needs leaders who will look out for the interests of working people and we will get that with Rich Cordray as Governor,” said Cincinnati AFL-CIO President Bill Froehle. “In electing our slate of candidates this fall, our membership can expect a government that is on our side, instead of having to look over our shoulders for the next attack,” Froehle said. “Rich Cordray and I have always stood on the side of working people and organized labor, and we will continue to stand shoulder-to-shoulder with you as the next Governor and Lt. Governor of Ohio,” Lt. Governor candidate Betty Sutton told the crowd. “We need leaders in Columbus who will stand up and fight back against those powerful interests on behalf of working Ohioans who have been left behind,” she said. “It’s on us to take back power and the only way to do that and change the course of our country is for working families to show up in November,” said Aftab Pureval the Democratic nominee for Ohio’s First Congressional District. “We stand with workers who are trying to collectively bargain for a fair wage, maintain benefits and protect jobs. Together we will take back Ohio,” said Pureval. The Labor 2018 campaign will involve thousands of union volunteers across the state and is designed to reach every union member in Ohio, along with non-union middle class voters. Utilizing neighborhood canvasses, phone banks and worksite leaflets, the program will ensure that working people understand the issues in the election and each candidate’s positions. The Ohio AFL-CIO is comprised of 600,000 union men and women who are affiliated through 41 international unions and 1,500 local unions. The Cincinnati event was one of a series of six kick-off rallies across the state with other events happening this month in Lordstown, Marietta, Cleveland, Columbus and Toledo.